All I have ever heard about the great Indian mango is true ? it is the ripest, freshest, and one of the most enjoyable fruits ever. Forget the scrawny, stringy tasteless Mexican mangoes that we have to settle for in the U.S. Mangoes are the real deal here ? and there?s more than one kind. Eight long months we have been waiting for mango season. In the meantime, we have had plenty of fruits to make us happy: papaya, oranges, sweet limes, pineapple, grapes, watermelon, cantaloupe, tender coconut, and guava. I like papaya in doses (not dosas! ), but it can go gelatinous fairly quickly if you cut it and put it in the fridge. Fresh pineapple has been a godsend, and I still try to have it every day if not every week. It was a joy to discover that watermelons were at their peak here in November and December; cantaloupes have also been quite good for some months now. Around Christmas, a Goan co-worker introduced me to Guava cheese, a traditional yuletide snack that?s basically just equal amounts of guava and sugar boiled and blended together, then hardened and shaped (sometimes into triangle wedges so as to attain a cheesy resemblance). And limes and sweet limes are around all the time for making fresh/sweet lime soda, a local specialty that?s so much more light and refreshing than a lassi. Unless, of course, you?re talking about a mango lassi. 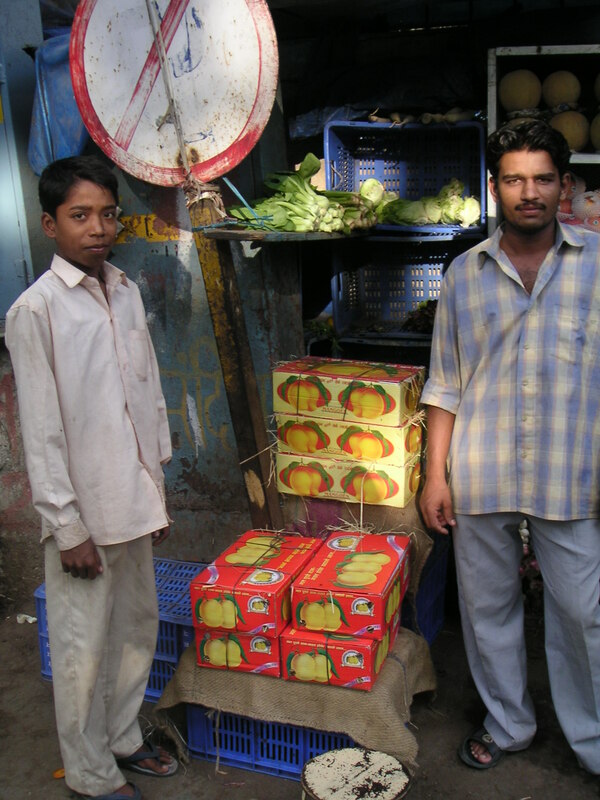 The mangoes made their debut at vendors? stands a little over a month ago, but they were still a bit expensive. Now that it?s May, mangoes are everywhere. You?ll see fruitwallahs pushing large, flatbed carts of mangoes through traffic. Elsewhere, throughout the day, you?ll see other men, perhaps on their way back home, balancing boxes of Alphonso mangoes on their heads. Now that it?s in the season, the mango is also on the menus at every restaurant, big or small, in ice creams, cakes, lassis, milshakes, fruit salads, chutneys, pickles, and more. Perhaps my favorite way to eat mangoes, other than plain, is sprinkled with some garam masala or red pepper flakes. To western tastes, the combination is unexpected. But the flavor is phenomenal, and a great way to liven up a mango that may have become too ripe. I suppose the dish is akin to a Mexican mango salsa, but you won?t find that here. This is surprising, because Indian and Mexican ingredients ? onions, garlic, chiles, tropical fruits ? are largely the same. There must be an Indo-Mex restaurant somewhere in the world. If not, I bet such a thing would go over really well in, say, California, New York, New Jersey, or Toronto. By the way, I deferred to the Epicurious spelling of the plural of mango in this post, even though I think it can be spelled without the “e.” I decided to double-check a reliable source before I became a blogging Dan Quayle.